Advanced Custom Fields (ACF) is a popular WordPress plugin which allows you to create additional content fields for WordPress posts and pages. The ACF Date Picker field allows users to associate a unique date with a page, post, or custom post type. 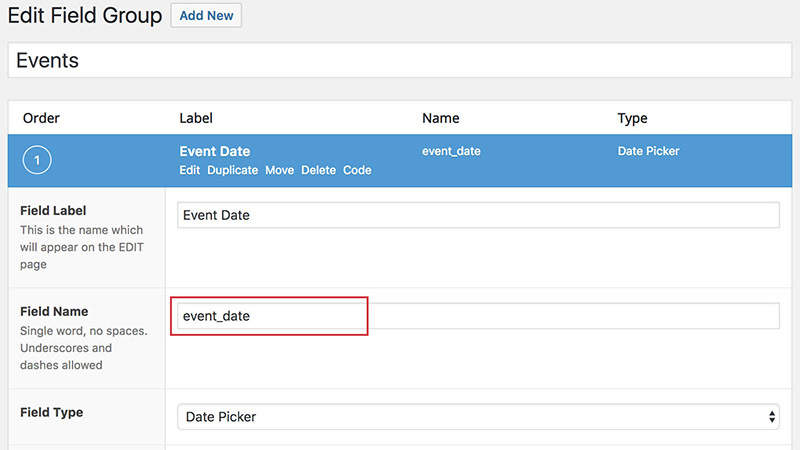 For example, if you have a custom post type of “event,” you could utilize the ACF Date Picker to create an event date field to store and display a date associated with each event. Let’s assume we have a post type called “event”. For our event post type archive, we want to order by the event date, not the published date of the post. We also want the earliest date to appear first and the latest date appearing last. We can use WordPress Hook pre_get_posts to alter the query before it is run. We don’t want to alter the query in the admin. So, in the code block above, we use the WordPress function is_admin to check if the query occurs in the admin and, if so, to return the query unchanged. The “event” post type archive page is the only place we want to alter the query. This can be done by checking if the post type is set, if the post type is “event”, and if it is in the main query. The query will now display the events custom post type in the desired order. In this specific case, however, we may not want to display past dates. This can be achieved by adjusting our query to pull only dates from today onward. The ACF Date Picker returns dates in the (yyyymmdd) format. By using the PHP Date function, we can compare the value of the current date to the event date. Now, we should only see events with an event date of the current date and future dates. By using the pre_get_posts filter, WordPress developers can alter the order of archive pages. The ACF Date Picker can be a very useful way to order the archive pages in WordPress. Philadelphia sports fan, coffee lover, tech geek, and friend to all cats.